After being sent back from the light, Alona Dare finds herself doing something she never expected: working. Instead of spending days perfecting her tan by the pool , Alona must now cater to the needs of other lost spirits. By her side for all of this - ugh - “helping of others” is Will Killian: social outcast, seer of the dead, and someone Alona cares about more than she’d like. Unfortunately for Alona, Will has other stuff on his mind, and Mina is at the top of the list. She’s the first ghost-talker Will’s ever met and she may hold answers to Will’s troubled past. But can she be trusted? Alona immediately puts a check mark in the “clearly not” column. But Will is - ahem - willing to find out, even if it means leaving a hurt and angry Alona to her own devices, which is never a good idea. So I've been waiting for a LONG time for the second book in this series. I absolutely adored the first, and I just wanted to dive back into Will and Alona's lives...er...deaths in Alona's case I guess. Just like the last one, I was really surprised with how much I liked Queen of the Dead. I know that the covers come off a little...gossip girly, but the way that Stacey Kade wrote out the characters makes you fall head over heels in love with them. 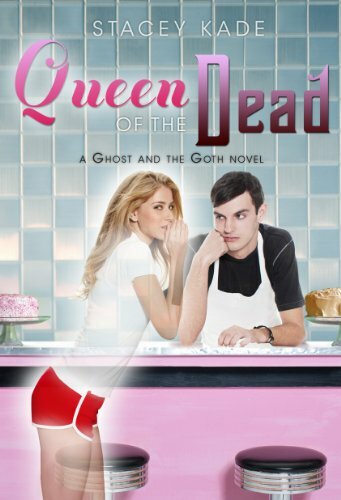 Queen of the Dead was even better than the first, with amped up plot lines, and even more fantastic characters. I so can't get enough of these books! They are light and fluffy without being entirely sugary sweet...if that makes any sense.They have a depth represented in both Will and Alona, and the situations that they get themselves into are thought provoking and totally captivating. Definitely an enjoyable read. Again, Alona was probably my favorite character. She's just so...spunky! She's definitely got an attitude about her. She's got this cold and calculating kind of mean girl personality that would normally make me hate on her. And yet...I just can't hate her. She is completely unapologetic regarding her personality which was great, and she is also striving to do good for the ghosts that haunt Will, despite having scathing comments for their wardrobe. I loved that she had to "be nice" in order to stay corporeal. It was hilarious having Alona have to spout out random things like "her hair is so shiny!...REAL hardwood floors?!?" when you can tell that all she wants to do is talk about the truly heinous turtleneck someone is wearing. Loved it! I also really felt for her when she found out that her parents were basically over her death after only a few months. I couldn't imagine my parents being over my death that soon if it were me. I would totally poltergeist their asses if they even thought about throwing out my stuff or having a "replacement" baby. I also really liked Will, though I feel like I identified more with Alona this time around. My favorite Will moments were when he was imagining what Alona would be saying if she were there. You really get the impression that both Will and Alona really care about each other and I thought their romantic scenes were hilarious...just because I was picturing what a normal person would see which was: Will laying on his bed making out with, and feeling up, nothing but air...ahah...I did get pretty annoyed with Will for following Mina around blindly for a good part of the book, but I suppose if I could see dead people and never knew another person who could too, I would be desperate for some more information about them. I really liked that both Will and Alona had their alone time. They are a team, but they aren't joined at the hip and constantly whining when they are apart like SOME young adult paranormals that I know of...their relationship is very realistic. I feel like you could walk into any high school in the US and find two people just like Will and Alona...aside from the whole ghost talker/ghost thing. I want to know more about the secret society of ghost-talkers! They seemed a little immature for me. They fought like children, had territory squabbles, and "tested" Will without regard for his safety, but I still liked them. Other than John and Mina, there didn't seem to be any malicious intent on their parts toward Will. I hated their stance on ghosts though. They believe that ghosts were just unfeeling echoes of a past human, and it's their job to get rid of the ghosts. I feel like Will's process of helping the ghosts move toward the light by accomplishing their unfinished business is much more humane, and I hope that the issue gets addressed in the next book. I'm still a little leery towards all of them. There had to have been a reason that Will's dad didn't continue contact with these people. I wonder if there is something sinister going on behind the front of helping humans get rid of their ghosts. That ending...wow total shocker! The twists and turns that are found in this book totally rocked. I wasn't expecting ANYTHING that happened...and I consider myself pretty good at figuring out paranormal books. I'm still not really sure what I feel about how Alona ended up. I kind of wanted Alona to get her own body back, or go into the light, or...something else. I feel bad for Lily's family and for Alona and Will both. I'm not going to reveal the ending, because it would probably ruin the whole book, but lets just say it changes pretty much everything you think you know about it. I have absolutely no clue how Ms. Kade is going to finish off the series and all I want to do is find out! I couldn't help but tweeting her after I finished...just to say how much I lurved her books, and she said the next book won't be out until next year!!! :( oh well...it will be a good birthday present for me. I give Queen of the Dead 4 out of 5 Keys! It was a super fantastic book that was just as good if not better than the first. Sometimes the sophomore addition to a series is super lame, either because the mystery has gone out from the first book, or the author doesn't know where the series is going, but I absolutely adored tthis one! My only complaint is that I wish the book was longer. 266 pages is not enough for me!!! I can't wait for the final book in the trilogy and hope it is just as fantastic as the first two! Thanks for this great review ! I've not read this serie yet, but heard so much stuff about it! I think with your review I will try it soon ! I love this series too! I really didn't think that I would and the only reason I picked it up was because the cover was different from everything out there. Way to go marketing! But I loved it and I wanted to cry in the end...OK so I cried. I have no idea what to expect in the third installment. "They are light and fluffy without being entirely sugary sweet...if that makes any sense." Makes total sense! The covers don't do this series justice.